Sponsored by Robert Russell Memorial Foundation - The Robert Russell Memorial Foundation was created by Bob Russell, a long-time Miami leader. It was activated at the time of his death in December, 1983. It funds programs for youth in Miami and supports many programs benefiting the Jewish communities in Miami, the United States, and in Israel. This collection of resources and Ideas with IMPACT projects on Holocaust Education is provided to ensure that the important lessons of the Holocaust are not forgotten and will be passed on from generation to generation. 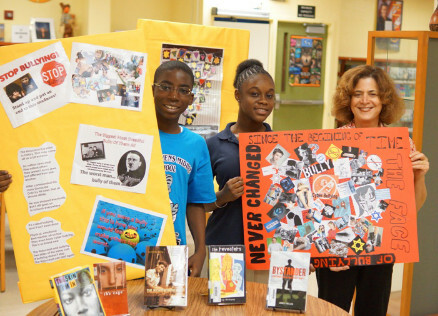 The Florida Holocaust Museum in St. Petersburg, contracted by the Florida Department of Education, invites you to use their dynamic literature-based lessons about the Holocaust, genocide, and character education. These large teaching trunks are designed to accommodate the needs of one class or a team of teachers from first grade to high school. The selected materials align with state standards and are grade appropriate. Loan periods for the trunks are for one month to six weeks and are available free of charge with free shipping to public schools throughout the state. Historical Perspectives of the Holocaust for high school. View/print the Idea Packets (guides that include lesson plans, worksheets, and resource lists) of the Holocaust projects by clicking on the project titles below. Contact the Author/Disseminator of the project for advice on implementing the idea. Apply now for an Adapter Grant (up to $400) for any of the Holocaust projects featured in the Ideas with IMPACT catalogs or see our online library of Curriculum Packets on Holocaust Education. Grant application deadline is December 10, 2018. Click here to apply. A powerful environmental sculpture with a series of outdoor spaces designed to lead the visitor through a procession of visual, historical, and emotional experiences. It provides cultural and educational programs for the community including field trips for students. An archive of 10,000+ online visual history testimonies of holocaust survivors. Includes information about: background history and statistics, conferences for educators, guidelines for teaching about the Holocaust, historical summaries, listings of Holocaust resource centers nationwide, and a searchable database of the research institute's archives and library. The Jewish Museum of Florida is a valuable resource for the study of Jewish identity and culture.